NASA is in the news again with some commentary on the Widom-Larsen ultra-low-momentum neutron theory of low-energy nuclear reactions. It seems the growing pressure to be the first success story for LENR as an alternative energy source is creating some interesting dynamics among the various competitors. NASA and the Widom-Larsen group, who are working on commercialization of LENR, have had quite the history. The following article details the unfolding drama. 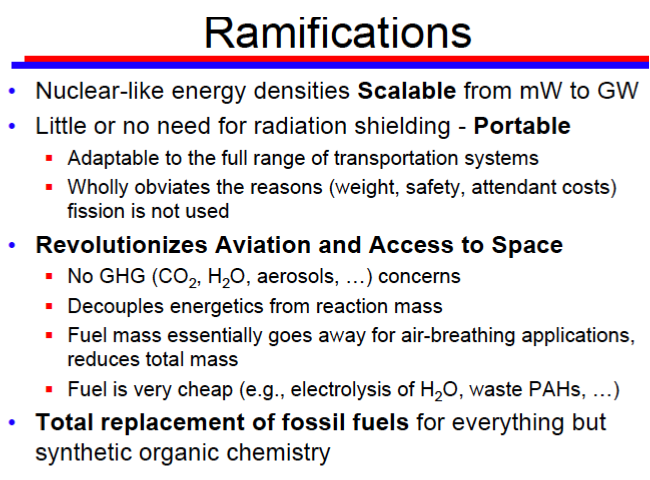 NASA scientist, Joe Zawodny, has made clarifications on NASA’s recently released video on LENR. This short video from NASA and Dr. Joseph Zawodny, Senior Research Scientist, states that the new type of nuclear reactions ‘has the demonstrated ability to produce excess amounts of energy, cleanly, without hazardous ionizing radiation, without producing nasty waste’. Some call it cold fusion, some call it LENR, NASA calls it a Method for Enhancement of Surface Plasmon Polaritons to Initiate and Sustain LENR.